Click here to spread the love on social media by joining our Thunderclap, and see below for how to send your Valentine message to the FERC commissioners at their homes via snail mail. We’re doing this for the whole month of February, so keep the messages flowing! CLICK HERE to get to the Sample Facebook Post. CLICK HERE to get to the Sample Tweet. CLICK HERE to download the Valentine. If you’d like to send additional Valentines to where the commissioners live when they’re staying in Washington, DC, I’m sure they’d appreciate it. Their Washington, DC addresses are below. Grab your paste, markers, fancy doily hearts and construction paper, and pour your hearts out. Here’s what to do in 6 steps. 1.) 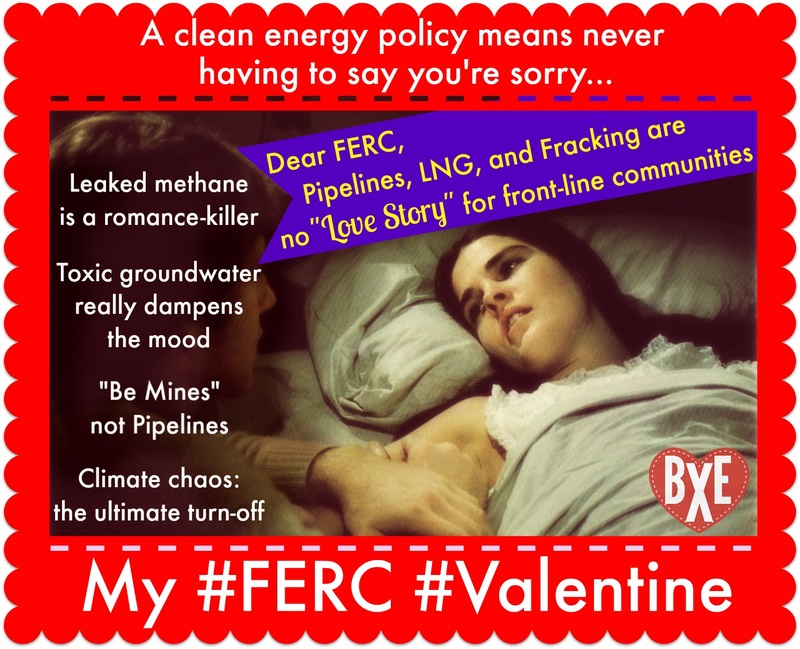 Create your Valentine Messages for the FERC commissioners. The more personalized, the better. You can make your own, or you can click the download above to get one that’s already made. 2.) Take pictures of your Valentine Messages. They can be pictures of the messages alone, or selfies of you holding the messages–whichever you prefer. 3.) Send your messages to the home addresses of the four FERC commissioners. Each commissioner has two addresses–one outside DC, and one inside DC. Send your messages to as many of the addresses as you’d like. The more, the better. These addresses can be found at the bottom of the above instructions flyer and in the text above. 4.) If you use Twitter, tweet your pictures at the FERC commissioners. Information on how to do this is found in the instructions flyer above. 5.) If you use Facebook, share your pictures there as well. Again, more information can be found in the instructions flyer above. 6.) Let us know you sent your messages by e-mailing your pictures to actions@BeyondExtremeEnergy.org. Please include your name and where you’re from. Please send only those things which you’re comfortable having shared online. Much gratitude for the folks who worked together to make this project happen.